According to the survey by the Arrested Lawyers Initiative carried out on the Turkish Justice Ministry’s statistics of their operations in the last five years, there is a steady increase in the use of anti-terrorism law on individuals by public prosecutors. According to our survey there is a steady increase in the use of anti-terrorism law on individuals by public prosecutors. So, while 8,324 people were indicted under Article 314 of the TPC in 2013, 146,718 people were indicted under the same Article in 2017. Number of the individuals who were indicted under Article 314 of the TPC in 2013. Number of the individuals who were indicted under Article 314 of the TPC in 2014. Number of the individuals who were indicted under Article 314 of the TPC in 2015. Number of the individuals who were indicted under Article 314 of the TPC in 2016. Number of the individuals who were indicted under Article 314 of the TPC in 2017. These statistics highlight that Turkey has indicted 221,366 people with the charges of being member or leader of an armed terrorist organization within last five years. 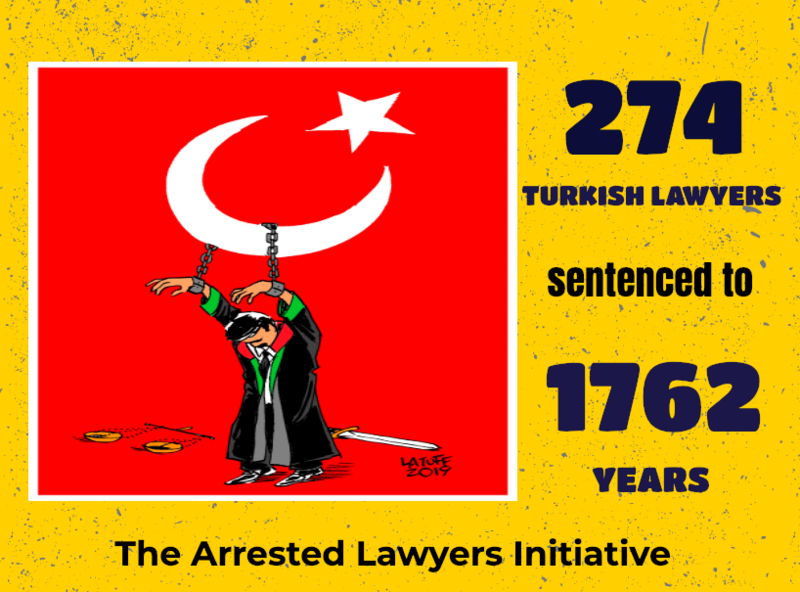 Statistics also indicate that, in 2017, Turkish prosecutors have opened investigations against 527.154 individuals under Articles 309, 310, 311, 312, 312, 313, 314, 315, 316 of the TPC which stipulates the crimes against the Constitutional order. Within the scope of those investigations, public prosecutors have indicted 176.491 individuals with the charges stipulated by the aforementioned articles whilst have given nol-pros decisions for almost seventy thousand individuals. As it is seen, investigations concerning 281.823 individuals are yet to be concluded. Year: 2017 | The graph demonstrates the number and the types of decisions given about the individuals who have been investigated within the scope of crimes against the Constitutional order. The problem is that the Turkish Penal Code contains neither the definition of what constitutes armed organizations and armed groups nor the offense of membership. The lack of legal definitions and criteria of what constitutes an armed terrorist organization and the offense of membership in the armed terrorist organization makes these articles prone to arbitrary application and abuse. Vague formulation of the criminal provisions on the security of the state and terrorism and their overly broad interpretation by Turkish judges and prosecutors make all critics, particularly lawyers, human rights defenders, journalists, and rival politicians, a potential victim of judicial harassment. This indistinct area under the Turkish Penal code is actively used by the Turkish government to investigate, prosecute and convict opponents. Turkey also has been using the vague formulation of the anti-terrorism legislation in his hostage diplomacy. According to a report entitled “Erdogan’s Hostage Diplomacy – Western Nationals in Turkish Prisons” undertaken by the Foundation for Defence of Democracies (FDD), more than 30 Western nationals have been jailed in Turkey since the failed military coup of July 15, 2016. Almost all of these foreign citizens were accused of terrorism-related offenses. Besides foreigners, deputies of People’s Democratic Party (HDP) and the Republic People’s Party (CHP), the chairperson and the director of the Amnesty (Turkey branch) Taner Kilic and Idil Eser, revered philanthropic Osman Kavala, 1,542 lawyers including presidents of 14 regional bar associations, more than 150 journalists, and innumerable others have all been accused of being member of an armed terrorist organization or aiding and abetting one or more of those. European Court of Human Rights decided (Imret vs Turkey, Isikirik vs Turkey) that convictions under Articles 220 § 7 and 314 § 2 of the Turkish Criminal Code violate Article 11 of the Convention. In the light of the aforementioned considerations, the Court concludes that Article 220 § 7 of the Criminal Code was not “foreseeable” in its application since it did not afford the applicant the legal protection against arbitrary interference with his right under Article 11 of the Convention (see Ahmet Yıldırım v. Turkey, no. 3111/10, § 67, ECHR 2012, and Işıkırık, cited above, § 70). Hence, the interference resulting from the application of Article 220 § 7 was not prescribed by law. The Court further observes that the applicant was given a prison sentence of six years and three months under Articles 220 § 7 and 314 § 2 of the Criminal Code. The length of his prison sentence was subsequently reduced to five years, two months and fifteen days and the applicant served his sentence. The Court notes that when demonstrators, such as the applicant, face the charge of membership of an illegal armed organisation, they risk an additional sentence of between five and ten years in prison, a sanction which is strikingly severe and grossly disproportionate to their conduct. The Court finds therefore that Article 220 § 7 of the Criminal Code, as applied in the instant case, would inevitably have a particularly chilling effect on the exercise of the rights to freedom of expression and freedom of assembly. Moreover, the application of the provision at issue was not only likely to deter those who were found criminally liable from exercising their rights under Articles 10 and 11 of the Convention in the future, but also had a great deal of potential to deter other members of the public from attending demonstrations and, more generally, from participating in open political debate (see, mutatis mutandis, Huseynli and Others v. Azerbaijan, nos. 67360/11 and 2 others, § 99, 11 February 2016; Süleyman Çelebi and Others v. Turkey, nos. 37273/10 and 17 others, § 134, 24 May 2016; Kasparov and Others v. Russia (no. 2), no. 51988/07, § 32, 13 December 2016; and Işıkırık, cited above, § 69).